Chelsea manager Antonio Conte is the preferred candidate to take over as Italy coach, according to Italian federation vice-commissioner Alessandro Costacurta. Conte, whose future at Chelsea remains uncertain, has one more season remaining on his three-year contract at Stamford Bridge. Upon leading Chelsea to the title last season, Conte signed a new deal but was only given a pay rise, not an extension. The 48-year-old coached Italy to the quarter-finals of the 2016 European Championships before joining the London club. Former AC Milan defender Costacurta, who is leading the search for the next Italy coach, intends to speak with Conte before the end of the season about the role. Costacurta told Gazzetta dello Sport: “I haven’t chosen yet but I think Conte is the one who could do the best. I’ll definitely talk with him in a couple of months. 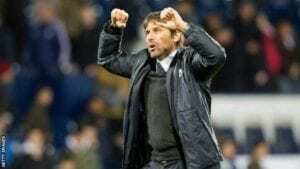 Conte appears to be Costacurta’s first choice, given his previous success in the role, but Roberto Mancini and Carlo Ancelotti are also in the frame. Costacurta said of Conte: “He’s already shown he knows how to be national team coach while the others haven’t yet. Italy plays friendlies against Argentina and England next month. Conte said earlier this month that he is not currently interested in returning to manage Italy, because he fully expects to see out the remainder of his 18 months at Chelsea. Chelsea are currently fifth in the league and at risk of missing out on the top four. Conte’s side visit the Etihad Stadium on Sunday to face Premier League leaders Manchester City, live on Sky Sports. The Blues also have a difficult upcoming trip to Barcelona to take on La Liga leaders Barcelona in the second leg of their last-16 tie in the Champions League. The tie is evenly poised after the first leg at Stamford Bridge finished 1-1.